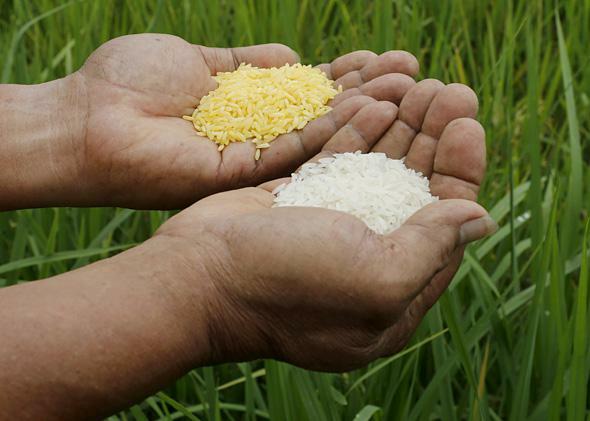 Golden rice inventor Ingo Potrykus: Greenpeace and others wicked for opposition. Is Opposition to Golden Rice “Wicked”? The genetically modified organism could save millions of lives. A scientist shows golden rice and ordinary rice at the laboratory of the International Rice Research Institute, south of Manila, the capital of the Philippines, on Aug. 14, 2013. Ingo Potrykus is a co-inventor of golden rice, which is genetically engineered to combat blindness and death in children by supplying 60 percent of the vitamin A they need in a typical daily helping of rice. His project has been opposed from the outset by environmental groups. Ingo Potrykus: I got involved because I’m concerned about food security. I realized it’s not just about calories, but also about the quality of food. I started working on it in the early 1990s with Peter Beyer. We started on the problem of iron deficiency, but that work didn’t pan out, so we switched to tackling vitamin A deficiency. By 1999 we had solved the problem. It was a surprise it worked because from the outset it looked totally crazy. AC: But environmental groups, including Greenpeace, opposed it? IP: They were against it from the beginning. They said it was fool’s gold because children would need to eat several kilograms of it to get their daily requirement. Children only eat around 300 to 400 grams a day. We worked out that Greenpeace wasn’t right, and that the rice contained enough to meet children’s needs, but we couldn’t prove that because we didn’t then have data from an actual trial. AC: That didn’t kill off the project, though? IP: Indeed no. The next big step was in 2005 when a group at biotech company Syngenta replaced one of the genes intended to produce beta carotene. The original gene, which makes an enzyme called phytoene synthase, came from the narcissus flower, and they replaced it with one from maize that is far more efficient. It produced 20 times more beta carotene, the molecule from carrots that combines with a second molecule of itself once inside our bodies to make a molecule of vitamin A. It was a big success. But again, we couldn’t prove we had enough to meet children’s needs, so the Greenpeace myth about golden rice being useless lived on. They continued to say that the problem was solvable by other means. AC: Do they have a point? Why couldn’t children just be given vitamin A capsules, or other foods that contain it? IP: The capsules are already being given through programs of the World Health Organization and charities such as Helen Keller International. They’ve been running the programs for 15 years, but they cost tens of millions of dollars a year. The problem is that besides the expense, you need the infrastructure to distribute the capsules. We’re aiming for people who can’t be reached this way, poor farmers in remote places. As for the possibility of eating foods that supply vitamin A, such as liver, leafy green vegetables, and eggs, the people we’re targeting are too poor to buy them. Some kitchen garden projects provide them, but despite these interventions we still have 6,000 children dying every day. These are not enough. Our aim is to complement, not replace, these programs. AC: There’s a project in Uganda and Mozambique to combat vitamin A deficiency by supplying sweet potatoes conventionally bred to contain extra beta carotene. Over two years it doubled vitamin A intake in women and children compared with those who ate conventional sweet potatoes. Could this be done with rice? IP: Sweet potatoes naturally contain beta carotene, so you can use traditional breeding to improve the content. Rice contains no beta carotene, so it’s impossible to introduce it without genetic engineering. Because the sweet potato project does not involve genetic modification, Greenpeace doesn’t complain about it despite the aim being identical to ours. But the experience with sweet potatoes shows that what we’re trying to achieve with rice is realistic. As soon as people get the potatoes, it improves their vitamin A status. AC: So where has the project got to now? IP: It took a long time, but by conventional breeding we bred our new golden rice with varieties to suit individual tastes in different countries. This is now completed in the Philippines, Indonesia, India, China, Vietnam, and elsewhere in Asia. AC: Is it always golden, and what does it taste like? IP: It always has a beautiful yellow color, and it tastes just the same as usual. Because it’s an integral part of the data needed to satisfy regulation authorities, professional taste panels have also tested it. AC: Last year, didn’t you finally obtain the proof you needed to show that golden rice provides enough vitamin A? IP: It was a long experiment by a group at Tufts University with colleagues from China. The outcome was fantastic. It was basically as good as it could be, with each pair of beta carotene molecules in the rice being converted in the body to one molecule of vitamin A, the theoretical maximum. This is four times better than the conversion from spinach, which took between seven and eight molecules of beta carotene to make each molecule of vitamin A.
AC: But the researchers got into trouble because of not following the correct protocols? IP: Tufts has recently come out with a statement after studying what happened. It seems that the researchers didn’t fully inform the participants in the trial that their children would be eating something that had been genetically modified, and that’s been used by Greenpeace to turn everything upside-down. But the important message from the Tufts report is that despite the procedural irregularities, the scientific data from the experiment stands firm and valid, that a single serving of rice provides 60 percent of the recommended intake for children. AC: The U.K. environment minister, Owen Paterson, has now weighed in to this debate by describing opposition to golden rice as wicked. Is this a moral tipping point that will potentially win emotional support for golden rice? IP: Unfortunately, there’s an enormous majority against genetic modification in Europe, so the brave U.K. minister will have lots of enemies. But he deserves support from wherever possible. I’m optimistic we’ve maybe reached a tipping point in Britain, and that’s something. But I’m not confident the “wicked” accusation will change the attitudes of Greenpeace supporters in Europe. Even Greenpeace founder Patrick Moore now supports golden rice and has accused Greenpeace of crimes against humanity for opposing it, but no one cares. AC: Why do you think Greenpeace and other groups such as Friends of the Earth are so adamantly against Golden Rice? IP: They’ve realized that it’s politically more effective to be radical and not judge things on a case-by-case basis. I’ve had high-level discussions with Greenpeace over the years, and it becomes clear they cannot tolerate any genetically modified organisms, even those that can be used for the public good. If you encourage them to change their position on golden rice, their response is the same: They’re against GMOs. That’s the position, and it’s very successful. AC: These groups tap into public opposition to GMOs. Why do you think there is such vehement opposition? IP: Since the early 1990s, the majority of the media has repeated the mantra that GMOs are highly dangerous for the environment and the consumer. This mantra is fuelled continuously by a well-financed and -organized anti-GMO lobby. One of the cleverest tricks of the anti-GMO movement is to link GMOs so closely to Monsanto and other multinational corporations, because Monsanto has no friends. That strategy guarantees millions of supporters because people are emotionally against multinationals and in favor of organic farming because of the perception that it’s run by idealists who protect nature and don’t make money from it. AC: For you, the controversy over golden rice must be incredibly frustrating. IP: I am very much frustrated, offering a technology for free that can save so many children and pregnant mothers. Since the invention of golden rice, 2.5 million children are estimated to have died each year from vitamin A deficiency. Around 500,000 go blind each year, of whom 70 percent die. They wouldn’t all have been saved by golden rice, but every delay means many unnecessary dead or blind children. AC: Where are things now with golden rice? IP: In the Philippines, one of the four agronomic trials was vandalized recently, just before harvest. But we’re hoping data from the remaining trials will be good enough for the regulatory authorities to give permission for the rice to be approved for use. AC: If approved, will the rice make a difference? IP: I have no doubt whatsoever that as soon as it’s used, it will make a big difference. I can’t think of a more powerful way to address vitamin A deficiency. AC: Do you think you’ll live to see the realization of your project? IP: I hope to live long enough to see it through. I was in my mid-50s when I started. It’s my 80th birthday in two months’ time.